I’ve been playing a lot of stealth games over the last year, and will be working on two moving onto the next year. I’d like to take a moment to take a close look at them and identify some underlying threads and loops that make them fun. 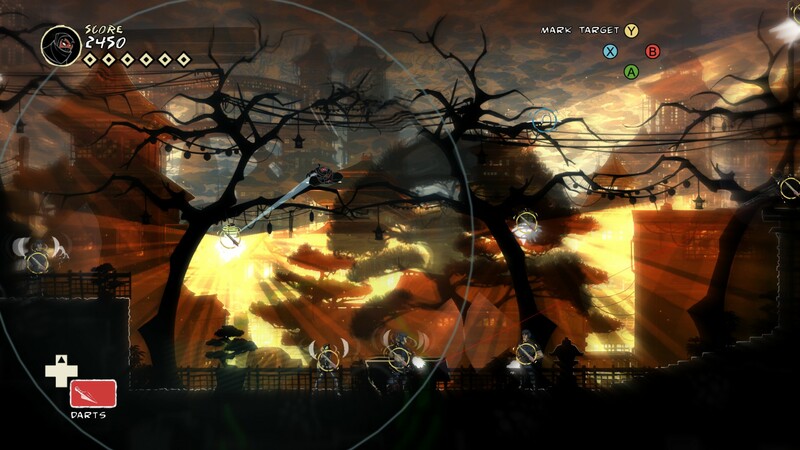 o Sneaking: Player is undetected and is traversing to the level’s goal, while avoiding enemy detection. o Fleeing: Player is detected by the enemy and must survive until she triggers an event that returns the game to the Sneaking state. Level Design that privileges traversal. Every combat-oriented game has enemies that inhibit player progression and must be dealt with violently or otherwise. Stealth games are distinct from other action games in that their enemies pose a very different type of challenge than their counterparts. Typically, individual enemies in action games pose little threat, and encounters are designed to use a combination of enemy types to encourage a certain style of combat. Enemies in stealth games fulfill a very different purpose, and operate alongside the levels that they populate to create puzzlelike traversal challenges. Whereas typical enemies use an “aggro-circle” system, guards have lines of sight, any area falling within a guard’s line of sight is threatened, and if the player enters this line of sight, they enter the “fleeing” state. This line of sight isn’t hardcoded, and cover created by objects in the environment alters this line of sight, allowing for safe-spaces to exist inside the line. Alternatively, players can use camouflage to blend in with their environment, making each guard’s vision-line much smaller. Forcing an enemy from the idle state to the searching state is one of the most important skills that players can master. By throwing a noisemaker at a certain area, players can mislead a guard towards a different part of the level, altering their line of sight and permitting the player to pass through an area undetected. Enemy AI must be predictable enough for players to exploit and manipulate these properties. Players may choose to fight these enemies while in the Sneaking state, using items like silent guns, grenades, and tripwires to advantageously defeat enemies from afar, or sneak up close to preform a stealth takedown. Eliminating guards, lethally or nonlethally, reduces the total number of lines-of-sight patrolling an area, making it overall safer to traverse a level. Violent confrontation of these guards is typically a less-optimal strategy, and pacifistic play is usually indicative of very skilled play. Combat mechanics may also be employed during the Fleeing phase, where guards call in reinforcements to deal with the player. Loud, lethal options like assault rifles are available to players to deal with pursuing guards as an interstitial step to seeking a way to return to the Sneaking state. Some games like Batman may allow the player to violently defeat all enemies in a level this way, allowing players to choose to forgo stealth altogether. While the core narrative of the stealth game is one of triumph in the face of disempowerment, very much one depicting an “underdog”, players still are afforded a number of advantages that allow them to overcome enemies outside of pure combat. I’ve identified four present in the games that I’ve studied. 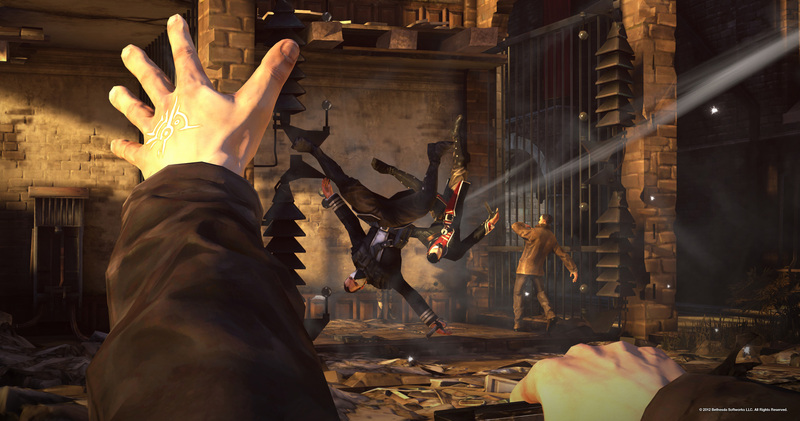 In games like Batman and Dishonored, players are given abilities that afford greater mobility, permitting access to parts of the level that guards cannot reach. Blinking onto the rafters or grappling up onto a gargoyle grants players a vertical advantage core to many of the more advanced strategies to their respective games. These advantages of mobility encourage players to make quick escapes and frantic, hit-and-run attacks. You may also notice that AI guards can very rarely crawl, and any time you’ve hid under a table or inside a vent, you’ve been exploiting an advantage of mobility. Oftentimes, the player’s avatar has the ability to enter a number of different states that may allow him to be less detectable by guards. This can be as simple as the crouch ability from The Last of Us, to Metal Gear Solid 3’s colorful ecosystem of environments and camouflage fatigues. These changes to the player’s avatar reduce or alter the size and shape of the guard’s cones of vision, allowing for easier traversal through the environment. Perhaps the most important advantage that the player can be conferred with is the advantage of intelligence. Simply put, the advantage of intelligence confers the player with a degree of knowledge over the current gamestate, revealing enemy positions, equipment, health, and paths. This allows players to strategically plan their movement around the environment, seeking out the path of least resistance. This advantage may manifest in systems like Farcry’s binoculars, Batman’s Detective Vision, or Metal Gear Solid’s SOLITION radar. I put “gadgets” here with some hesitation because oftentimes, gadgets serve to facilitate the previous three types of advantages. 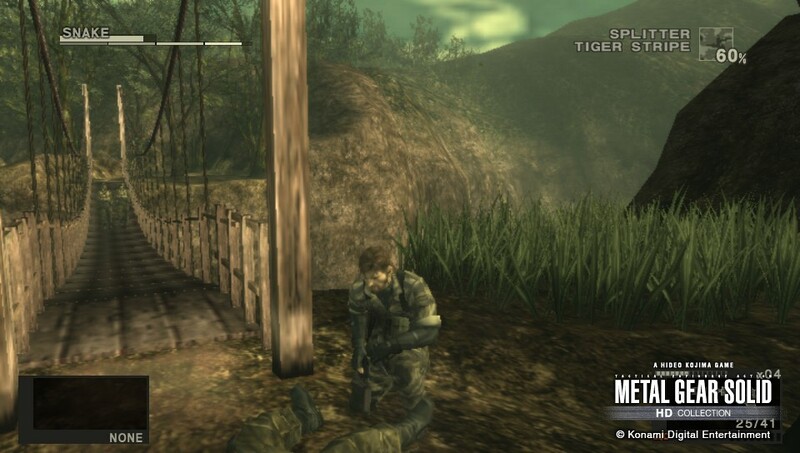 Items like Splinter Cell’s snakecam afford intelligence, and Snake’s cardboard box confers a hiding advantage. Nonetheless, items and tools are a central aspect of these kinds of games, and searching for emergent uses from their combination is a central part of that joy of expression inherent to the genre. I believe that by now we have established that the core goal of the stealth game is traversal rather than combat. Tactical movement through space ties the different approaches to stealth that these games may deploy, and completing a level feels more like solving a spatial puzzle than surviving a series of encounters. To that extent, levels must be designed around the movement of guards and players through space. They must permit the guards enough space to threaten a significant portion of the level, as well as enforce deliberate and strategic movement through space on terms of the player. I am not a good enough level designer to identify the underlying threads that make good stealth environments, but I can identify a few common characteristics. 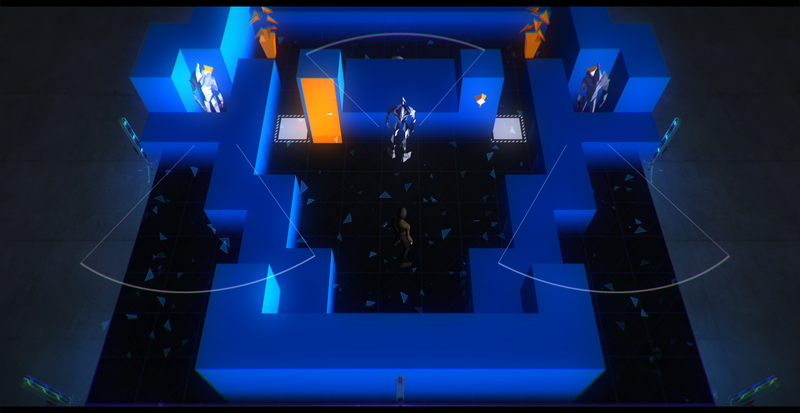 Stealth game levels have a multiplicity of paths, allowing for players to feel a degree of authorship over their particular methods of solving levels. Metal Gear Solid 5’s Camp Omega is one of the best environments I’ve ever played in for this kind of design, and its opening minutes feature no more than four means of entering the base. Cover, as I have stated before, cuts off enemy line-of-sight, creating safe spaces for players to stay in. The interspersal of cover, and its limited usefulness as guards move around it, creates an important rhythm as players dart in and out of it as they move to eliminate enemies and reach their goal. 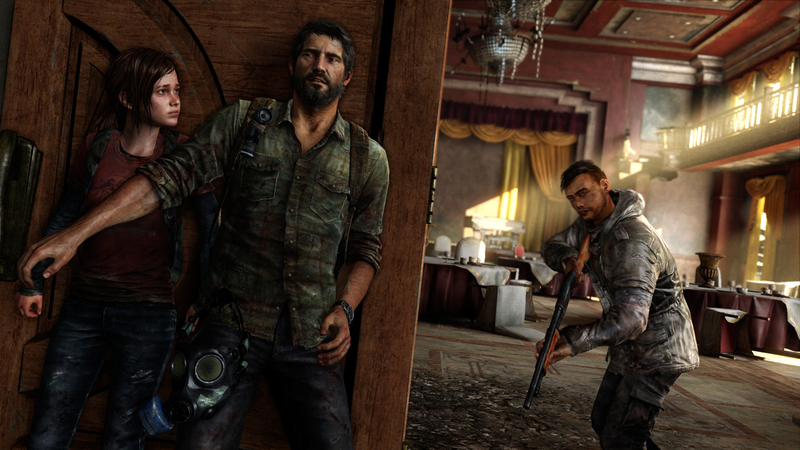 One game that I believe achieves in this regard is The Last of Us, which very deliberately distributes its cover to convey a sense of vulnerability for the player character, even after mastering AI manipulation and movement patterns. Finally, stealth game levels tend to feature areas that only the player can access. Crawlspaces, drainage ducts, rafters, and ventilation shafts confer tactical advantages that guards lack. Dishonored did this well by prohibiting vertical movement for its AI guards, allowing for any raised, vertical area to be a potential safe-space as players blinked towards their goals, which were typically positioned to demand horizontal traversal. So that takes us back to our core loop of sneaking and fleeing, the movement between these two states is core to good stealth games. 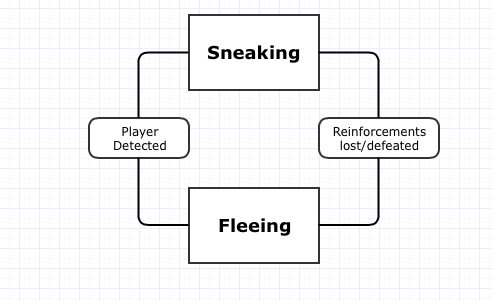 Weak stealth games tend to have poorly designed fleeing segments, leaving players without any options to compensate for their failures and effectively bring the gamestate back into the sneaking state, so designers of stealth games should strongly consider the affordances players are granted to solve problems in the fleeing stage. Instantly failing the player for being detected isn’t good design. There must be a way to absolve failure and move between the two states in the loop. I write this moving out of a year of closely studying stealth games. I’m a huge Metal Gear fan and played a lot of hide and seek in my youth, so unqualified as I may be, I think I can make some general statements on what makes good stealth games. More importantly, I’m believe this knowledge would be fundamental to me as I move onto my next two projects, which are both stealth games. Thank you for the article. I have a strong interest in the structures and creative aspects of stealth games, so this is a very educational read on the formula. If I may go off on a tangent from there, I was quite drawn in by the co-op stealth aspect of Peace Walker, and wondered what kind of unique challenges that approach presents (compared to single-player stealth). If you have written or know of any article on that front, I would like to give it a read. I really like how well you summed everything up, but there is one thing I think you forgot to talk about, that being how much firepower the games gives you. My favorite example of limiting your firepower is in MGS3 were they gave you a silenced pistol for the first hour or so to let you get used to having it and then took it away and sent guards your way. But than you could find an assault rifle right before the part were they gave you two silenced pistol, from there you build up your arsenal by exploring and depending on how much you found fighting off guards would be easier or harder.